The more than week-long Los Angeles teachers’ strike revived an issue Democrats campaigned on in the 2018 midterms and promised to prioritize in the new Congress: funding and support for public schools and educators. But the longest government shutdown in U.S. history and the party’s current focus on immigration and border security has stalled momentum on education at the federal level, leaving advocates worried that raising teacher pay could get placed on the back burner long term. Even without the shutdown — which seemed set to end after a short-term funding deal was reached Friday — it’s unlikely lawmakers would have taken up major education-related legislation immediately. The 116th Congress was only sworn in a few weeks ago; in the House, Democratic leaders are still assigning members to key committees and subcommittees. The strikes inspired support on social media and among voters, who helped pave the way for the Democratic Party’s 40-seat gain in the House last November. Still, Democrats are facing pressure to act on the issue, after siding with teachers who staged a rising number of strikes since last year — in West Virginia, Oklahoma, Kentucky, Arizona, and most recently California, as well as a possible repeat in Colorado, where teachers already walked out last April. The strikes inspired support on social media — spawning the #RedForED hashtag — and among voters, who helped pave the way for the Democratic Party’s 40-seat gain in the House last November. One educator even joined their ranks; Jahana Hayes, the 2016 Teacher of the Year, was elected to Congress by the state of Connecticut. The party leaned on the issue in high-profile governors’ races as well, including in Wisconsin, where the state’s superintendent of public instruction, Democrat Tony Evers, unseated the incumbent Republican Scott Walker. 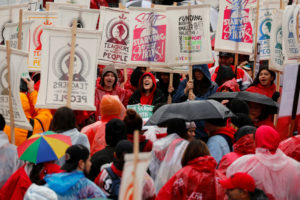 Yet it’s unclear how much attention the new Democratically controlled House will give to the #RedForEd campaign, even as teacher strikes like the one in Los Angeles continue grabbing national headlines. Randi Weingarten, president of the American Federation of Teachers, the nation’s second largest teachers union, noted in an interview with the PBS NewsHour that Democrats included a pay hike for teachers in the party’s “Better Deal” 2018 midterm platform. The plan called for raising teacher wages by canceling the tax cuts for high-income earners included in the GOP tax law. Weingarten and other union leaders touted the plan at a rally with Democratic leaders in Washington in July 2018, just as the midterm general election was getting underway. “We were inspired by the Better Deal proposal,” Weingarten said. “I know they want to” raise teacher wages, she added, referring to congressional Democrats. The “Better Deal” plan called for raising teacher wages by canceling the tax cuts for high-income earners included in the GOP tax law. Martin Rodriguez, an elementary school teacher and member of the Los Angeles Unified School District, said he supports the “Better Deal” plan but has little faith in movement on the issue at the federal level. “The impact will only be seen at the state levels,” Rodriguez said. This year, the groundswell of support quickly ran into the reality of the partial government shutdown, which ground government to a halt, stalled progress on most legislation in Congress and raised doubts about whether the divided government would be able to come to any compromises. Weingarten said she remained hopeful that lawmakers could eventually strike a bipartisan deal on teacher pay. She pointed to the Senate, where Health, Education, Labor and Pensions Committee Chairman Lamar Alexander, R-Tenn., and Sen. Patty Murray, D-Wash., the panel’s top Democrat, have worked together in the past. Teachers unions and other advocates will keep pressure on Congress to act regardless of the shutdown, Weingarten said. “Whether under the banner of a ‘Better Deal’” or through other proposals, “we will be fighting for appropriate investment” in America’s teachers, Weingarten said. Virginia Democratic Gov. Ralph Northam included a pay increase for teachers in his budget proposal last month. The plan would increase teacher pay by 2 percent. Combined with a 3 percent raise that took effect last year, it would boost teacher pay 5 percent starting in July. “This isn’t just about the educators who deserve to be paid more. It’s about improving the education we offer our children by ensuring that we can attract and retain the best and brightest educators,” Northam said in his State of the Commonwealth address in December. Education advocates in the state have said the pay raise isn’t enough to get state educators on par with the national average pay of $59,660. Next week, the advocacy group Virginia Educators United will march at the state capitol in Richmond to demand higher compensation for teachers, as well as an increase in school support staff such as counselors, nurses and social workers. The teachers union in Denver, Colorado — the largest school district in the state — voted earlier this week to authorized a strike. The Denver Classroom Teachers Association, which represents over 3,000 members, was in the bargaining stage for higher teacher wages with Denver Public Schools. The strike was slated to start next week, but the school district asked the state to intervene and it’s unclear when the strike will take place. Last April, thousands of teachers walked out and rallied in Denver to protest pay and school funding. The governor and state lawmakers in Mississippi began 2019 with a push to raise teacher wages. The effort comes as the hashtag #BlueForMSTeachers continues to circulate on social media, with teachers asking supporters to wear blue to call attention to the issue. Both the Texas House and Senate have put forth two different proposals to increase education spending. The state senate offered a proposal to give a $5,000 raise for teachers across the state. The Texas House wants $7.1 billion for public education funding with less specific guidelines on how to ramp up wages for classroom teachers. In a Dallas Morning News op-ed, Republican Gov. Greg Abbott said the state should increase education funding with financial incentives. Meanwhile, a public education march to the Capitol is set for March 11.